In the Internet marketing conversion is all about the efficiency of advertising. And this efficiency is measured on each stage towards the ultimate goal. Here we are getting to the key point in understanding the affiliate networks and the Internet marketing in general. Below we will review the transition from the simple viewing of the ad to the target action. Now, what is the efficient advertising? If you consult with the Wikipedia, you’ll get the feeling that calculation of efficiency will require involvement of a think tank or even two. And you will be not far from the truth :). But for making reasonably fast and informed decisions you need fast techniques that will be clear both for the advertiser and publisher who promotes an offer. Such methodology is the assessment of conversion. Before introducing the concept of conversion, let’s outline the life cycle of a Click on its way to the target action. Before clicking an ad the visitor needs to first see it, look at it. Viewing is the first acquaintance. The next step is the Click on the banner or link to redirect the visitor to an external landing page. The page to which the visitor gets after clicking on the advertisement link. Despite the fact that there may be complex schemes for various redirects of visitors between websites, in the end the visitor gets on the advertiser’s website. Here the visitor may fill in a registration form, play a game, or add goods to the cart, i.e. perform some targeted actions. Part of them are primary actions with the earning potential (e.g. if a person leaves his/her contacts then he or she becomes a lead). Such actions are called Leads. Once the user has performed some preparatory steps (primary actions), Target actions that are payable by the advertiser according to the terms of the offer come into. This is the action of the visitor being the target of the advertiser, the action for which he pays. For example, let’s take two adjacent actions, such as View and Click. Our ad is in-between. I.e. the ad is the bridge for the user from the view to the click. If we know how many users the ad has brought to the click, we can assess its efficiency. Visitor proceeding from one action in the chain to the next action. If we nit-pick, it’s the accomplished fact of the clickthrough. But we won’t nit-pick. Let’s better look at the example demonstrating why we need to assess the conversions and their benefits. If we calculate the share of users who clicked the ad, we’ll get the following ratio: Conversions / Previous actions. In other words, we will know how many actions turn into conversions. In other words, we will know the Conversion rate. It’s the ratio between the performed actions (conversions) and the total number of visitors. 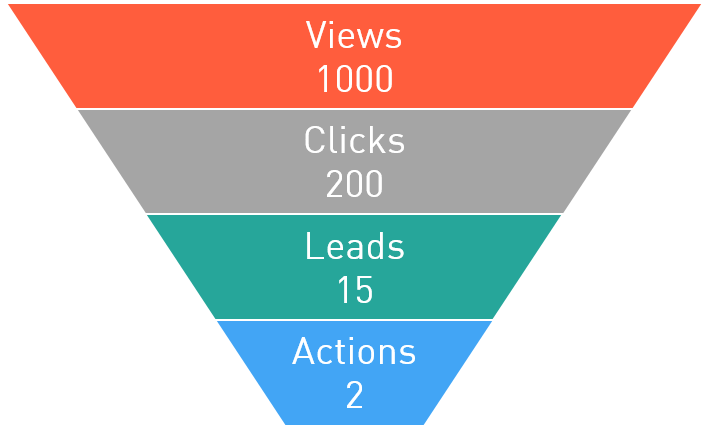 We can calculate the views-to-clicks conversion rate. It is referred to as CTR (Click-through rate). As you guessed, it’s the ratio between clicks on the ad and views of this ad. These figures are very important, since they allow us to assess the ad efficiency. If we look at CTR of each ad we’ll see that despite the same number of clicks (200) the first ad was clicked twice as much as the second ad: 20% VS 10%. We can assume that it is more effective (other things being equal, of course), because the conversion rate of the first ad is higher. View → Click CTR (Click-through rate) Ratio between clicks and views. You can assess the attractiveness of advertising indirectly, judging from its exterior. 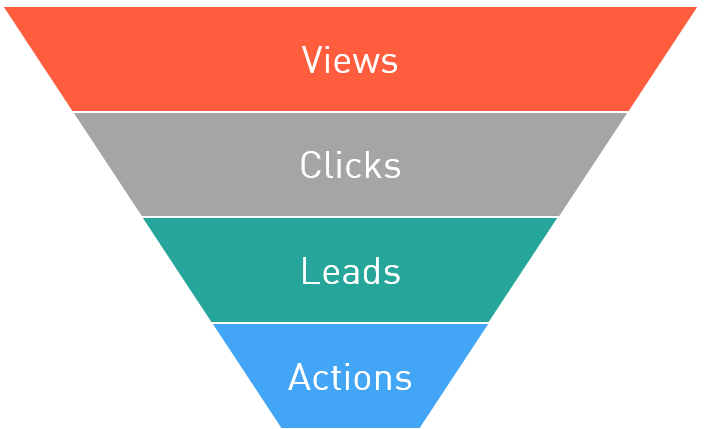 Click → Lead CR (Conversion Rate) Often referred to as the conversion, because this figure is very informative — it means the number of users who clicked on ads and became the leads. I.e. they became customers who are in fact ready to use our product (or service). The conversion rate allows indirect assessment of the advertisement efficiency. And since it is calculated based on the huge amount of raw data, it can be used to predict the effectiveness of different ads. Lead → Target action AR (Approval Rate) This figure shall be reviewed in the context of CPA schemes. In such schemes there’s always the advertiser acting as the source of feedback. The advertiser tells us whether the target action was performed or not. Only the advertiser can do it, because these targeted actions are tracked in the advertiser’s system. To generalize, the advertiser approves the actions. And AR figure tells us how many Leads became the Target actions. 2 ÷ 200 = 1%. Such conversion is called Macroconversion. It is used for approximate calculations: e.g. we can estimate the revenue from 1000 clicks on our ad. The revenue or fee from one click is called CPC (Cost Per Click). 5 × 1% = 0,05. So, if we provide the traffic for the offer diligently and calculate the conversions we’ll have the highly valuable figures — the cost of one click (we made a forecast of this figure above based on the conversion) and the cost of 1000 impressions. In CPA model it means the cost from the click that you earn by providing the traffic for a specific offer. In CPA model it means the cost from 1000 impressions that you earn by providing the traffic for a specific offer. Suppose the advertiser offers 250 rubles per one pair of sold shoes (don’t forget, this is the target for CPS model). We provide traffic for this offer and after a week 10 pairs of shoes will be sold. So we get 2500 rubles. Let’s look at the offer statistics to see the number of clicks on the link to the shoes. Suppose there were 13000 views and 1500 clicks. 2500 ÷ 1500 = 1.67 (rubles) — CPC in our case. eCPC (Effective Cost per Click) = sum of the fees for all publishers under the offer ÷ number of clicks on the links under the offer. This figure, in fact, strongly depends on the statistics collection period. For example, if the offer is new, then few publishers work with it, the statistics is scarce, and it is not very representative. After all, each publisher uses his/her own approach: some use arbitrage, some work with forums, others work with news websites. Conversions will differ greatly in these cases. However, after some time the statistics will become representative and almost non-sensitive to external factors. Taking this into account, we differentiate between two effective CPC: for a week (7D eCPC) and for the last three months (3M eCPC). 7D eCPC is easier to collect, because you don’t need to wait for 3 months. It may reflect fluctuations in supply and demand, such as New Year’s boom when the figure soars to the heavens. 3M eCPC gives a more sober estimate because it covers a long period and does not depend on holiday deviations. But on the other hand it does not take into account obvious mistakes and miscalculations, poor quality traffic, etc… well, it’s a very generalized and average figure. The affiliate network willingly shares the eCPC figure since it allows publishers to estimate the benefits of working with the offer.